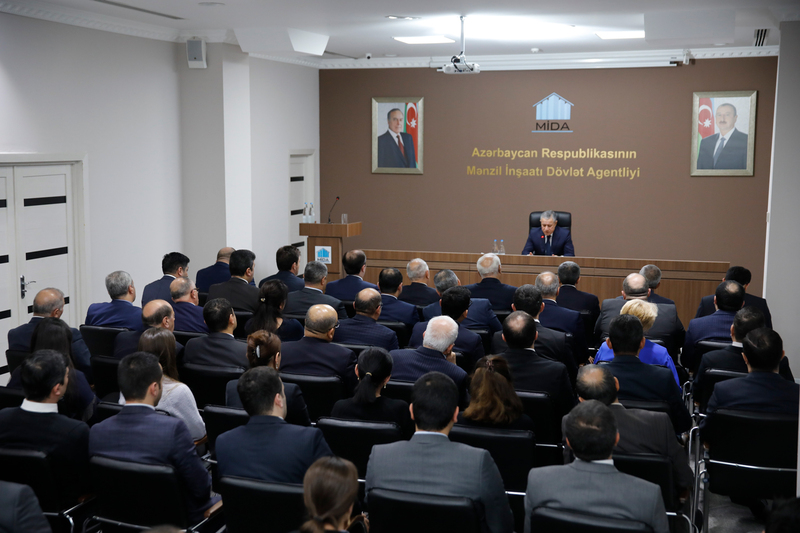 On December 27, 2018, a meeting on the results of the last year’s outcomes and the impending issues took place in the administrative building of the State Housing Development Agency. 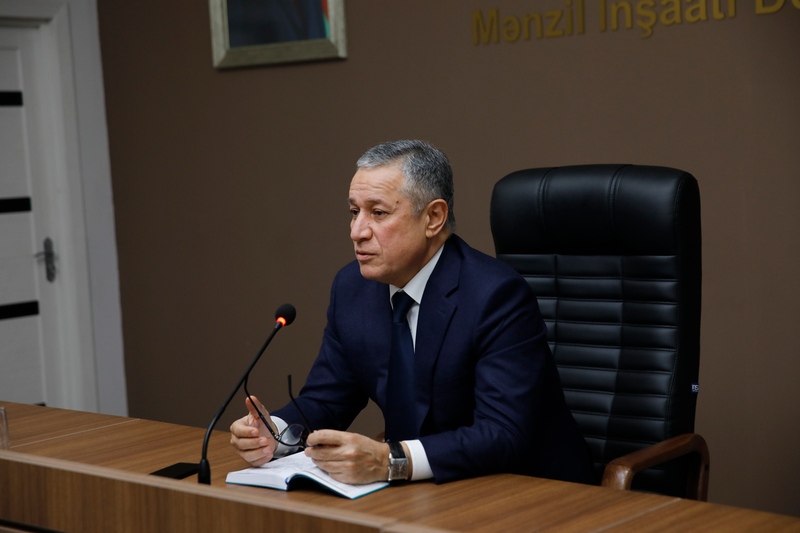 Chairperson of the State Housing Development Agency Sadiq Sadygov gave comprehensive information about the main directions of the organization’s activities in 2018, and their results. 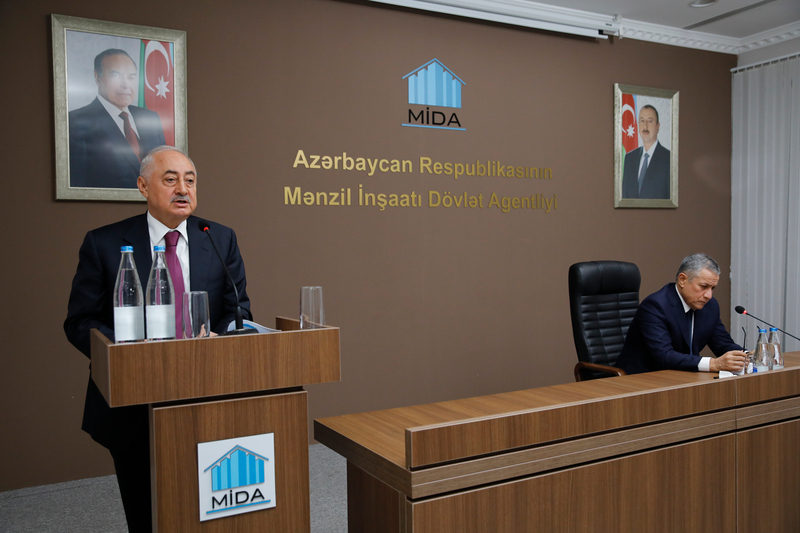 Underscoring the large-scale and consistent actions carried out towards lifting the social welfare and improving housing conditions of the population in our country during the recent years under the leadership of President of the Republic of Azerbaijan Mister Ilham Aliyev, Sadiq Sadygov said the year 2018 was significant with a series of important events in the activities of the Agency. It was mentioned that inauguration of the Yasamal Residential Complex – the first project of the State Housing Development Agency – with participation of President of the Republic of Azerbaijan Ilham Aliyev and country’s First Vice-president Mehriban Aliyeva, and laying the foundation of a new residential complex in Yasamal was of special importance. Construction of all residential buildings of the Yasamal Residential Complex, of which foundation-laying ceremony had taken place with participation of President of the Republic of Azerbaijan Ilham Aliyev and First Lady Mehriban Aliyeva on December 24, 2016, the secondary school designed for 960 pupils and the kindergarten for 240 children have been completed. Special attention was shown to ensure that all necessary conditions are created in the complex for residents’ comfortable life, rest corners created, and various amusement facilities and swings installed for children’s entertainment. Roads for cars and bikes were built within the complex, and necessary infrastructure created to ensure easy movement of people with restricted physical abilities. One of the significant events in the activities of the Agency in 2018 was the selection of 324 apartments in buildings 1, 2, 3, 4, and 5 of the Yasamal Residential Complex through the “Affordable Housing” system over the portal “Electronic Government” (www.e-gov.az) on 05.09.2018. Out of these apartments, purchase of 278 has been completed. Of the 278 apartments purchased on preferential conditions, 57 are one-room, 146 two-room, and 75 three-room apartments. All apartments were handed over to their owners with fully finished interior, provided with kitchen furniture, individual heating system (including the heating equipment), as well as with water, gas and electricity meters. 61 of the citizens who owned apartments purchased them at their own expense, while 217 acquired them through preferential mortgage credit. Moreover, Sadig Sadygov gave information about the Hovsan Residential Complex, the second project of the Agency. 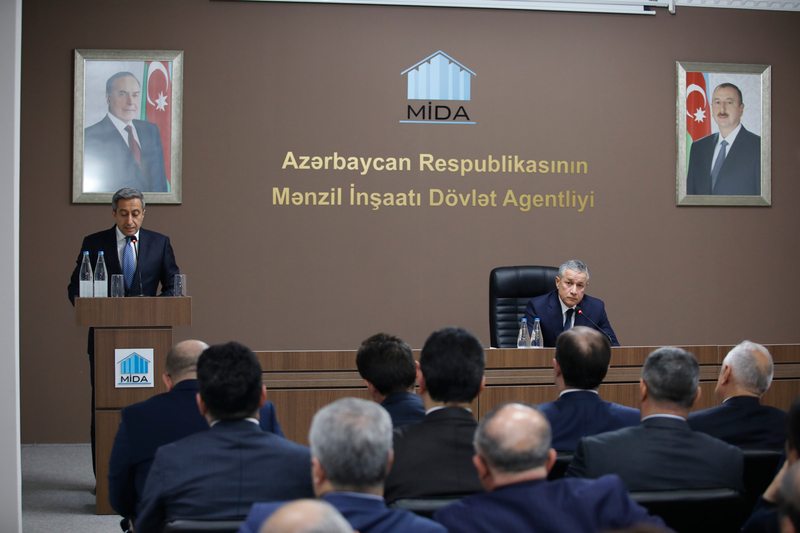 It was noted that construction works on the Hovsan Residential Complex, of which foundation-laying ceremony had taken place with participation of President of the Republic of Azerbaijan Ilham Aliyev and country’s First Vice-president Mehriban Aliyeva, continues at rapid pace. In the Hovsan Residential Complex, which is being constructed on a 20-hectare territory, near Hovsan settlement, Surakhany district, concrete-structural works of the last floor of the first 7-storied residential building are nearing the end. At the same time, construction of other 7-storied buildings is continuing. Being realized in a 20-hectare area in Surakhany district, Baku city, this complex will consist of 11 apartment buildings. Out of them, 7 will be seven-storied, with 18 entrances, and 4 ten-storied, with 1 entrance. In these buildings, in general, will be 2962 apartments, with 280 of them being one-room, 1401 two-room, 980 three-room, and 301 four-room, in accordance with the plan. Along with the apartment buildings, all conditions will be created necessary for peoples’ comfortable residence, with making broad yards, green zones, child playgrounds, and construction of social infrastructure objects. Two kindergartens, both designed for 90 children, a secondary school for 1920 pupils, a trade centre and a hospital are expected to be commissioned into operation on the territory of the complex. Moreover, creation of a relevant transport infrastructure and integration it into the public transport system of the city is scheduled. 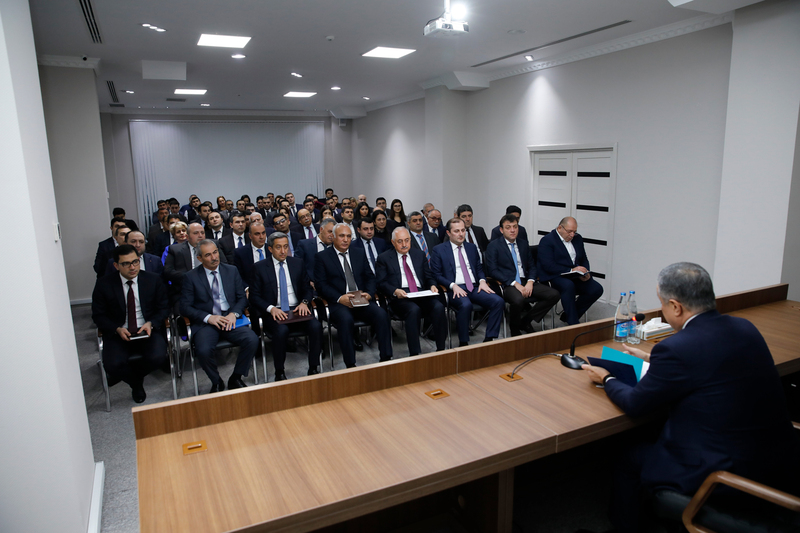 Giving information about the new residential complex to be constructed on a 15.4-hectare territory, along the external circular road in Yasamal district, Baku city, Sadig Sadygov mentioned that the Complex would consist of 40 buildings, with 22 of them being nine-storied, and 18 twelve-storied. Altogether, these buildings will accommodate 2202 apartments, of which 160 will be one-room, 114 of studio type, 674 two-room, 1128 three-room, and 126 four-room. Area of the apartments will vary between 33 and 96 square metres. All apartments will be handed over to the residents with interior finishing works completed, and provided with kitchen furniture. Along with the residential buildings, commissioning of social and service objects, child playgrounds, three one-storied kindergartens for 350 children (100, 125, 125), three-storied secondary school building for 1200 pupils is scheduled. Open type car parking place for 2200 cars is intended to be created on the territory. With the objective of ensuring the comfort of the residents in the Complex - located in a clean and favourable part of the city, close to work places - renewal of the transport infrastructure and expansion of possibilities are planned. 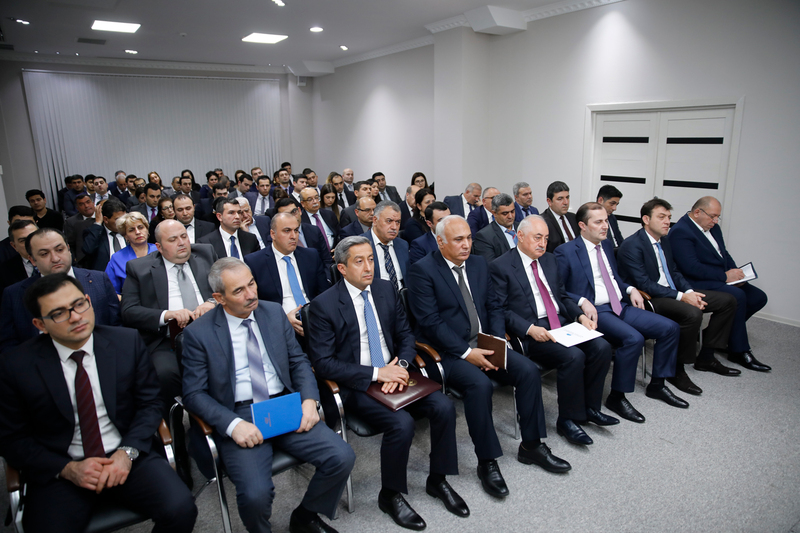 Moreover, with a view to continuing projects on affordable housing in the regions of the country, works on placing land parcels in Ganja and Sumgait cities at the disposal of the Agency are nearing the end. Other officials of the Agency who spoke at the event with summary reports, along with Sadig Sadygov, gave detailed information about the works done in the relevant areas, and impending duties.